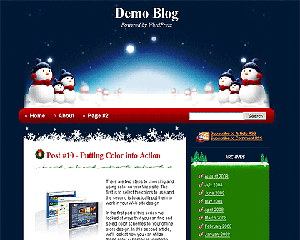 A fun and blueish Christmas theme. Widget and Gravatar ready. Changeable image header. Last tested on WordPress v2.7 with artwork by Masaki Hoshino, snow by Scott Schiller and icons by N.Design Studio.